My father was an exceptionally good jazz pianist. He was a self-taught amateur. He played every night at home after his daily work and at sing-along parties with our neighbors on Saturday nights. And he composed songs for his own satisfaction and for the delight of his friends. I loved the sounds he played, improvised, and composed. The joy and excitement that swirled around his music making at our family and neighborhood musical get-togethers was infectious and socially transforming. I wanted to be like him; I wanted to be able to do what he did. So after starting me out at age 4 with informal jazz piano lessons at home, he took me to a local community music school in Toronto for regular lessons with Vincent Cinanni, a professional jazz, pop, and classical pianist and composer—a wonderfully artistic, creative, and kind man. I was five-years-old. Soon I began to play at our musical gatherings, surrounded by supportive adults who sang and played along on guitar, harmonica, and violin. Although my K-6 elementary school music education was unsystematic, with infrequent opportunities to engage in music making, I was asked to play piano at many school and community functions. These little gigs started to build my musical-personal identity as “the musician” among my peers and teachers. During my middle and secondary school years, two deeply talented musicians-music educators—Glen Wood and Bob Cringan—worked diligently to involve my peers and I in all forms of music making and listening. Because of them, I became involved in band and jazz band groups as a performer, arranger, composer, conductor, and a novice teacher of my peers. These rich and varied experiences allowed me to take leadership roles in my school music programs and in many community music groups, including my own professional dance bands and jazz bands. And so it was—with a rich and joyful foundation of musical experiences—that I began to study music at the University of Toronto and that I made a commitment to music education. 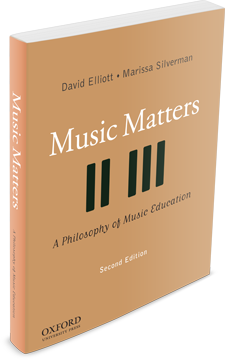 All of these experiences formed the bedrock of the praxial philosophy of music education I wrote in the first edition of Music Matters (1995) and, now, in MM2, with Marissa Silverman. My point in relating my personal story is to suggest that although verbal statements about the values of music education are necessary and fundamental forms of advocacy, the most powerful means of making our case are the processes and social settings of musical particip-action that yield deep satisfactions for participants of all ages and ability levels. For example, a parent engaged in joyful music making and listening usually means a child engaged in music making and listening. A school principal, politician, or business person involved in personally and/or social satisfying experiences of singing, playing, composing, and listening is likely to support school and community music education. So in addition to teaching our students, we need to find more and various ways to provide meaningful musical experiences for our students’ parents and friends, other teachers in our schools, and political and business leaders in our communities. And we need to find ways to create community music groups and school-community partnerships that provide opportunities for parents, colleagues, and others to engage in joyful music making and listening and witness our music teaching expertise in action. So what about written and verbal advocacy? Yes, of course, it’s imperative to consider scholarly views about the values of music and music education as a basis for evaluating advocacy statements and as material for valid and reliable advocacy claims. But it’s essential to keep in mind that music education advocacy (or MAD, for short) and music education philosophy (or MEP) are fundamentally different. Why? Because MAD too often focuses on the “short, fast sell” using fluffy sound bites, incomplete or “pop research,” and t-shirt slogans (“Music Raises Math Scores!”) tailored to fit the latest “school reform” mandate (e.g., Common Core Standards). Thus, MAD blogs, ads, and articles often “dumb down” the complexities of our profession, mislead parents, and demoralize excellent music teachers. This is why it’s so important to approach MAD cautiously and critically, and to teach future music educators to do the same. By the way, I’m terrible at math. TERRIBLE! MEP is about thinking very carefully about what people say and do, being skeptical when reading MAD claims, and asking: Where’s the large body of recent and excellent research that we must have before we can be confident in saying “music education can raise math and reading test scores, or music education improves academic achievement?” MEP is about combining scholarly sources in many fields—and the informed, practical wisdom of experienced teachers—to carefully formulate our professional aims, goals, objectives, curriculum content, teaching strategies, and assessment procedures. But, and……….— here’s the takeaway message—long before I started to read advocacy statements and scholarly discussions about the natures and values of music, music education, and community music, I experienced over and over again—in my childhood and adolescent years—the creative and emotional powers of music through active music making and music listening. This probably holds true for many people, including most music educators and community musicians. If so, then our concept of “advocacy” should include but go far beyond words. We should—we must— put our musical, educational, financial, diplomatic, and social skills and understandings to work to make it possible for more people in our communities to experience the joys and satisfactions of music-making and, therefore, to “make a life in music” to the extent they desire. The future strength and security of school music programs depends not on using music for MAD purposes, but on our ability to combine valid, evidence-based verbal and written explanations about the values of music education with our best musical actions toward achieving much wider and more varied approaches to music instruction inside and outside schools. We must find ways to engage more and more people of all ages, in all walks of life, in personally and socially meaningful, satisfying, and joyful musical particip-action.